ON THE banks of the Sepik River, villagers go about their daily life. Children are on their knees playing in the mud, rowing dug-out canoes and splashing in the water, naked except for a few colourful bangles. A man with chiselled muscles is chopping wood from a sago palm, which his wife collects and takes to a nearby wooden contraption to extract the sago, used in cooking. There are few signs of modern life besides our cruise ship anchored near the mouth of the river and the lime-green gumboots one sandy-bottomed toddler waddles along the shallows in. 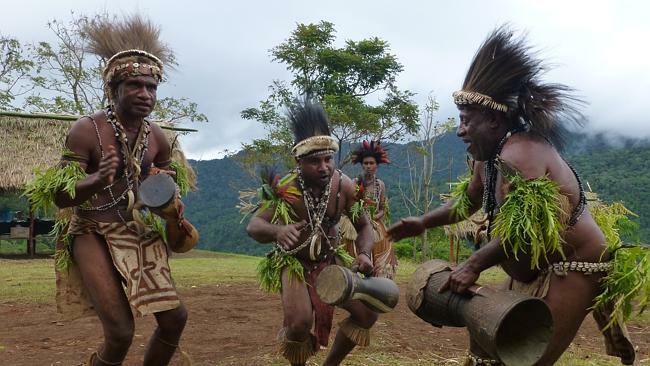 Kopar Village is our first port of call in Papua New Guinea on our 19-day APT cruise on the Caledonian Sky, which had begun in Jakarta, Indonesia. It is noticeably poorer than West Papua, which makes up the western half of the island of New Guinea but is part of Indonesia.